Put the semisweet chocolate into a medium heatproof bowl. Fill a medium saucepan with 2 inches of water and bring to a simmer over medium heat. Turn off the heat; set the bowl of chocolate over the water to melt. Stir until smooth. Once the chocolate has melted and is smooth, remove from the heat. Line a sheet pan with parchment or waxed paper. Holding the Pizzelle dip into the chocolate, lift and twist slightly, letting any excess chocolate fall back into the bowl. Set dipped Pizzelle’s on the parchment paper. 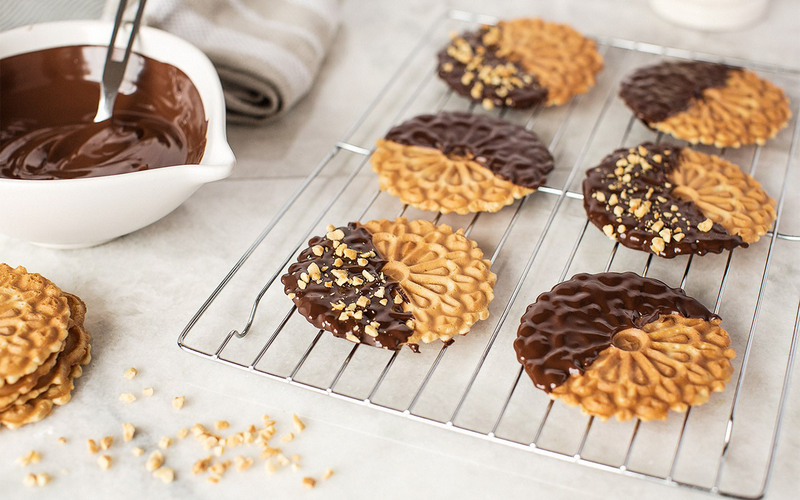 Set the chocolate dipped Pizzelle’s aside until the chocolate sets, about 20 minutes.